Dubai, UAE, September 20, 2017: In Italian, the word Pasticcino means ‘small pastry’; a bite-sized bon-bon that melts decadently in the mouth. The Pasticcino Bag, the latest must-have style from Weekend Max Mara, is just as delectable. With its fluffy volume, oversized clasp and cheerful patterns this bon-bon is a happy pleasure and a delicious treat for the eyes. An instant mood-booster, it sets a playful tone for easy weekends, spirited parties or spontaneous evenings after work. The Pasticcino Bag is a super clutch, with a good attitude. Its proportions are purposefully exaggerated and playfully attenuated, while its shape is vaguely vintage-inspired. The bag is completely unstructured save for its pewter trim and large metal spheres that clip together like giant gumballs. Its oversized balloon shape can be both inflated or collapsed down into a soft void, depending on its contents. Its fluffy softness is irresistible, cuddling up to the body, or snuggling under an arm almost like a prized pet. 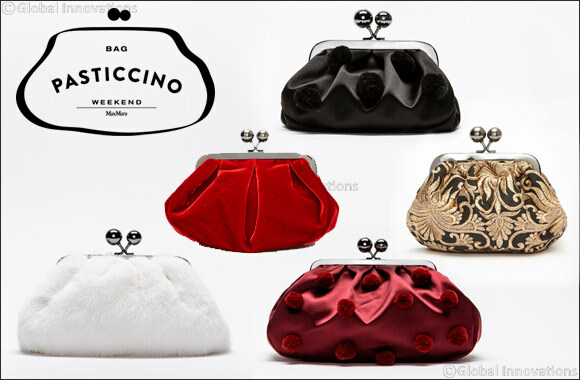 Though it possesses the air of a giant coin purse, the Pasticcino is infinitely versatile. Offered in two sizes and a range of materials, it easily veers from fancy to fun, from an easy piece to run around with, to a more important, statement-making accessory. The small-sized clutch presents a more traditional option, while a fun oversized version adds a high-spirited kick to any outfit. A detachable thin strap can transform the bag from prim clutch to a more practical shoulder bag in a snap. The Pasticcino Bag is a bag with a personality. Any way you take it, anyway you wear it, this is a bag you will love, clutch, and want to eat up. It is a beautiful, joyful, light-hearted object that is delicious in every way. Just like a bon-bon.